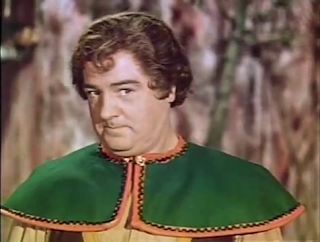 Cody Hamman revisits a childhood favorite, the 1952 Abbott and Costello comedy Jack and the Beanstalk, for Film Appreciation. Comedy duo Bud Abbott and Lou Costello quit working together nearly thirty years before I was born and both men had passed away long before I arrived in this world, so I could understand if someone my age never watched an Abbott and Costello movie growing up. That said, I grew up on Abbott and Costello, and one of their comedies was one of my favorite, most-watched films when I was a child. It was an age appropriate one, too - an adaptation of the fairy tale Jack and the Beanstalk, which has been making the rounds since the 1700s. It was producer Pat Costello, Lou's older brother, who had the idea to drop the duo into the fairy tale story. They took the concept to Universal, the studio that made most of their movies, and presented the idea of following the style of The Wizard of Oz: the movie would be book-ended by sepia tone sequences, with the more fanciful middle stretch being shot in color. Universal didn't want to spend the money it would take to make the movie in color, so Abbott, the Costellos, and producer Alex Gottlieb made it independently. 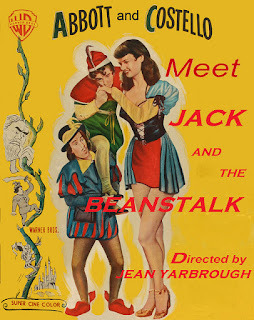 Screenwriter Nat Curtis was hired to mix the humor of Abbott and Costello with the elements of fairy tale, and veteran director Jean Yarbrough, who would go on to direct all 52 episodes of the TV series The Abbott and Costello Show, was brought on to bring this idea to life. The film begins in our reality, circa 1952, with Abbott and Costello as bumbling pals Mr. Dinkel and Jack, who have been hired to babysit problem child Donald (David Stollery) and his infant sister for the night. 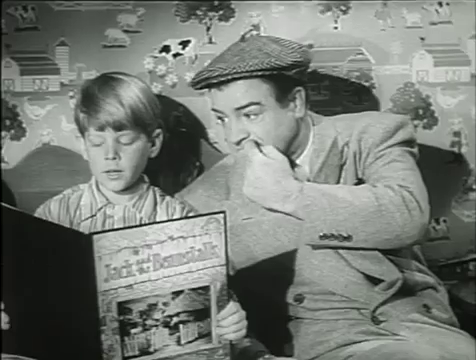 Finding a Jack and the Beanstalk book in Donald's room, Jack excitedly snatches it up and asks the kid if he can read it to him... But as it turns out, Jack's reading skills are so poor that Donald actually has to do the reading. As Donald begins to read, "once upon a time", the film cuts to the colorful world of the fairy tale. Just like in The Wizard of Oz, this reality is populated by actors we saw playing other characters in the Earthbound segments. Costello's character is still named Jack, but now he's a child-like peasant who lives in a land terrorized by a thieving giant who resides high in the sky. Abbott is the local butcher Mr. Dinkelpuss; Shaye Cogan, who was Donald's older sister Eloise, who hired Dinkel and Jack for the babysitting job, is now Princess Eloise; James Alexander, Eloise's fiancé Arthur, is now the wealthy Prince Arthur, who Princess Eloise is being forced to marry since the giant stole her father's crown jewels. 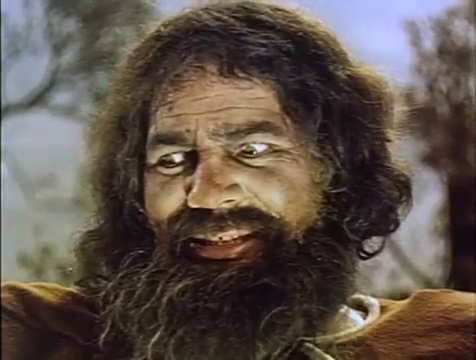 The giant has also stolen all of the food in the land. He stole a hen that laid golden eggs from Jack's family's farm, and when Jack's father sought to retrieve it the giant killed him. Jack and his mother are in such financial trouble at this point that they have to sell Jack's beloved cow to Mr. Dinkelpuss. Jack is so dim and gullible that Dinkelpuss is able to trick him into accepting "magic beans" for payment for the cow rather than money, but thankfully this works out for him. Jack plants the beans near his house, and overnight they sprout a giant beanstalk. A beanstalk that rises all the way up to the giant's place. I guess it's a plot of land that somehow floats in the sky. I don't know, just go with it. The giant has now kidnapped the princess, the prince, and the cow, so Jack and Dinkelpuss climb the beanstalk on a brave rescue mission carried off by two of the least likely heroic characters you'll ever see. Of course, Dinkelpuss's intentions aren't entirely pure - he has heard about that golden egg-laying hen and would like to take it for himself. 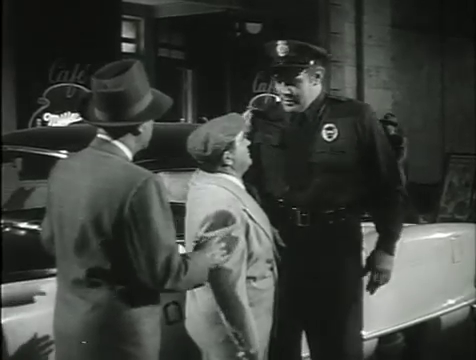 During the opening segment, Abbott and Costello had a run-in with a towering police officer played by 6'6.5" retired boxer Buddy Baer, and it's Baer who plays the giant in the fairy tale section of the film. 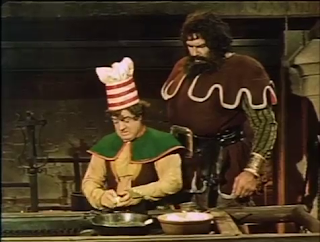 I didn't put that together when I was a kid; since the giant has long hair and a beard and the police officer doesn't, Baer isn't as instantly recognizable in his second role as the other actors are. Costello was 5'5", making it easier to present Baer as a giant when they share the frame, and Baer also gains some extra height from the boots he wears. Jack and Dinkelpuss are quickly captured by the giant, who recites the rhyme "Fee-fi-fo-fum, I smell the blood of an Englishman. Be he alive, or be he dead, I'll grind his bones to make my bread" while carrying them back to his castle. At the castle, we meet another actor pulling double duty. 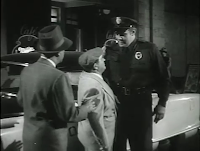 Dorothy Ford appeared earlier as the police officer's girlfriend, who Costello tried to flirt with by saying she's "5'2" with eyes of blue" before she stood up and turned out to be 6'2". Here she's the giant's housekeeper, who banters with a talking harp that is much more of an antagonistic character than she is herself. 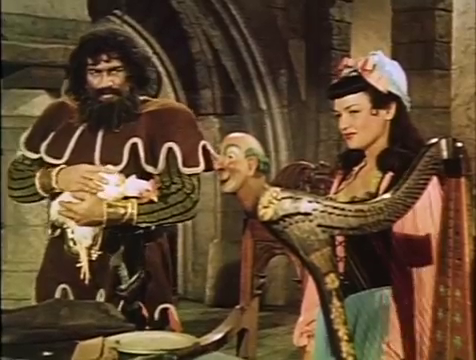 The second half of the film consists of Jack and Dinkelpuss, with the help of the housekeeper, trying to figure out a way to escape from the giant's castle with the prince and princess (and the cow and the hen), while Eloise and Arthur legitimately fall in love in the midst of everything. All this and I haven't even mentioned yet that Jack and the Beanstalk is a musical - as I've said a few times, The Wizard of Oz provided the template they were working from here. Most of the songs aren't very memorable at all, but some of the them struck a chord when I was rewatching the film again after a couple decades away from it, and there is one song in particular that has stuck with me throughout my entire life and comes to mind regularly - it's one sung by Costello called "I Fear Nothing". It starts out "I fear nothing when I am in the right / Whoever pushes me around will find me full of fight", and that's the part that is often in my head. Jack and the Beanstalk may not have any outright classic Abbott and Costello comedy routines, but it still offers a decent amount of laughs and has a fun tone. It moves along very quickly, wrapping up in just 81 minutes, and being a lighthearted adaptation of a fairy tale it's a wonderful introduction to the comedians for children. 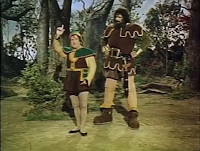 Jack and the Beanstalk, which I would most often watch at my maternal grandmother's house when she was babysitting me, provided a lot of entertainment for me when I was a child. I loved it back then, and revisiting it now was a very nostalgic experience. 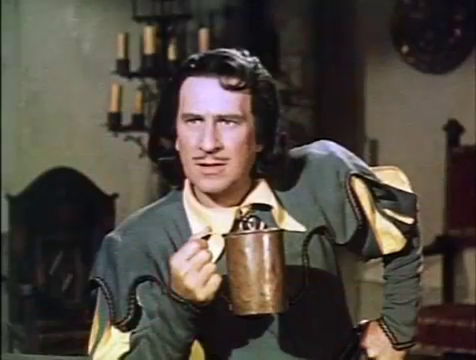 If you have very young children, I would highly recommend showing Jack and the Beanstalk to them - and it should be relatively easy to find, because the film is public domain. Anyone can release a copy of it. Some prints, like the one I watched for this write-up, present the book-end scenes in black and white instead of sepia.